MINNEAPOLIS and REHOVOT, Israel–Stratasys recently teamed with USA Luge to inject additive manufacturing into its quest for Olympic gold in Pyeongchang, South Korea. 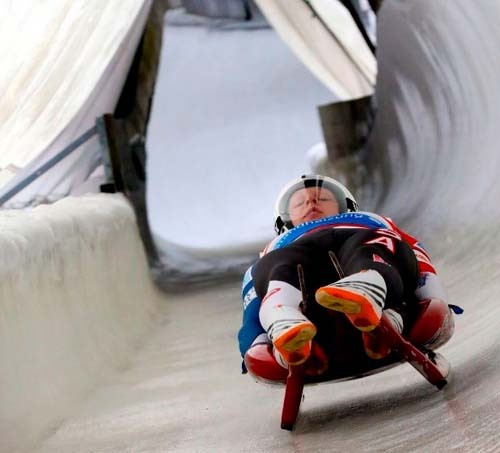 Harnessing the power of Stratasys Fused Deposition Modeling (FDM) 3D printing technology, the luge team rapidly and cost-effectively built and test customized racing sleds tailored to the body of each athlete. USA Luge tapped into a wide range of high-performance materials from Stratasys to 3D print key layup and sacrificial tools used during manufacturing of carbon-fiber composite sleds. The advanced functionality of FDM enables an unprecedented level of customization not possible with standard composite fabrication–a critical success factor in racing sleds that often travel at speeds upwards of 87 miles per hour. Additive manufacturing was key for engineering mandrels for the racing team's Doubles Tower, a composite structure at the sled's front that is used to accurately position riders' legs during competition. Extremely difficult to fabricate due to complex, trapped-tool geometry, the structure guarantees proper athlete fit and position while racing. Leveraging the Stratasys ST-130 sacrificial (wash-out) tooling material, team designers were able to 3D print the mandrel, lay up and cure the composite structure, and wash out the tooling material–all in less than one week. Stratasys ( www.stratasys.com) is a global developer of applied additive manufacturing technology for industries that include aerospace, automotive, healthcare, consumer products, and education. "Competitive luge racing is an extremely demanding sport where fractions of a second are the difference between winning and losing," said USA Luge Technical Programs Manager Jon Owen, in a press release. "Our riders depend on comfortable, aerodynamic sled designs to win races. In teaming with Stratasys, we've become much more competitive on the world stage–continuously adjusting designs and running them on the track much faster than traditional processes. Additionally, we've balanced both comfort and performance by tailoring the sled to each rider's body, while minimizing fabrication cost and time." Based on the success of Doubles Tower construction, Team USA has pushed the technology even further by 3D printing the entire sled body layup tool. This particular design incorporates a removable middle section, allowing tool length to adjust based on each rider's height. Driven by these efforts during prototyping, designers used this same tooling for final sled components during competition.